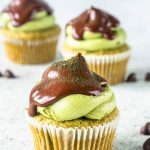 Matcha Chocolate Chip Cupcakes! Can you believe this? I was set on making Matcha cupcakes of some sort for #cupcakemondays. And I was struggling, because I had so many different ideas, and I just couldn’t make up my mind! Then, I went for a run. And when I came back, this little lightning bulb appeared on top of my head! Chocolate. Chips. The sponge is matcha flavored, with chocolate chips in the batter. Actually, we will put half of the chocolate chips in the batter, and the other half will be sprinkled on top of the cupcakes before baking. The reason: if you put all of the chocolate chips in the batter before scooping the cupcakes into the pan, the chips will sink to the bottom of the cupcakes when you bake them. And it doesn’t work to coat the chocolate chips in flour either. Trust me, because I baked 3 batches of this cupcakes to get it right! So, just mix half in the batter and sprinkle the other half on top of the cupcakes before baking. This will ensure that you will have chocolate chips through the whole cupcake. 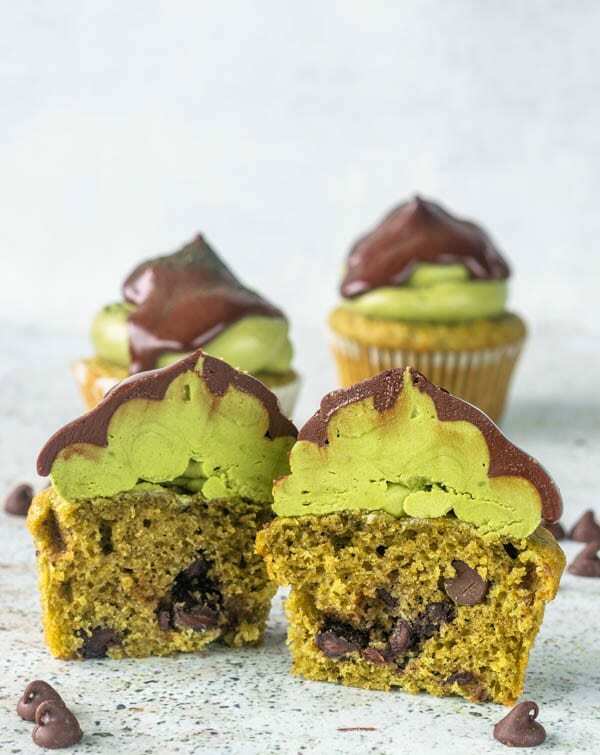 This matcha chocolate chip cupcake is very moist and fluffy. It will keep well in the fridge for up to 3 days, frosted or not. Actually, the cupcake itself is very delicious without the frosting too. Since I had to make these matcha chocolate chip cupcakes 3 times, because I wanted to get the recipe 100%, I ended up with way too many unfrosted cupcakes. So I just froze them and they will be an awesome quick snack for when I take my son to the park, or we have a road trip somewhere. Or just for an afternoon in, enjoying a cup of tea. Pull one of the freezer and wait an hour to be able to enjoy it! It will be like enjoying a delicious matcha chocolate chip muffin! You can freeze the unfrosted cupcakes for up to 3 months, very well packaged! The frosting is a simple buttercream, with matcha powder added. It’s simply a favorite. And it’s the same one I use to fill my Matcha Macarons. 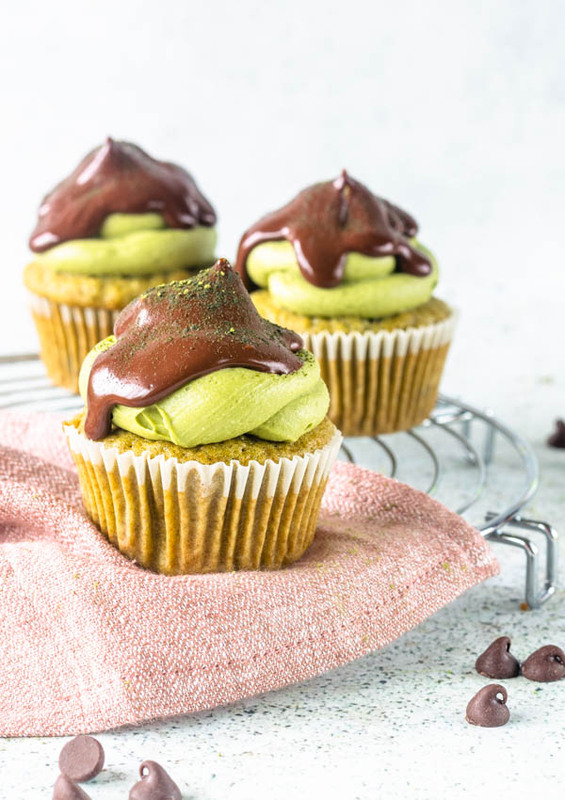 The flavor of the matcha, both in the cupcake, as in the frosting, is not overpowering. It’s subtly sweet and velvety. If you’d like for the taste to be stronger, you can always add one more teaspoon of matcha both to the cupcake sponge, and also to the frosting. The dark chocolate ganache is such a wonderful player in this cupcake! It helps bring everything together. 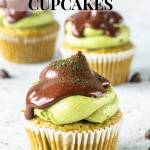 It cuts a bit of the sweetness of the buttercream, and it works so well with the matcha flavor! Needless to say, this cupcake is a winning combo between the best things in life!!! Hope you all like my cupcakes and have a wonderful day!! I’ve been regularly doing #cupcakemondays and you can check all of my cupcake recipes here. And I can already tell you a couple of my favorites: the Caramel Cashew Cupcakes, and the Macadamia Coconut Cupcakes. These Matcha Chocolate Chip Cookies are the best! The sponge is matcha flavored with loads of chocolate chips in the batter. On top, we pipe some Matcha Buttercream, and pour dark chocolate ganache over it. The flavors are beautiful! Sift flour, match powder, baking powder, baking soda and salt together. Set aside. Finally, add rest of the buttermilk. Whisk and then, add remaining flour together with HALF of the chocolate chips. Make sure to just fold the mixture until combined. Spread the other half of the chocolate chips on top of the cupcakes. Don’t press them down, simply let them rest on top of the cupcakes. Bake for 12-15 minutes. Until puffed, and lightly golden. Cream butter on medium speed, until creamy, about 1 minute. Add powdered sugar and matcha and beat until mixture is fluffy and incorporated, about another minute. If mixture seems too stiff, add one or two teaspoons of milk. If it seems too runny, add one or two teaspoons of powdered sugar. Add vanilla and mix until combined, 30 seconds. Chop your chocolate very finely. I like to grate mine with a grater. In a small saucepan, heat heavy cream until just comes to a boil, or microwave until very hot to the touch, 30-45 seconds. Pour hot cream over chocolate. Mix with a spatula until all chocolate has melted. Let it rest on top of the counter for about 1 hour so it will have a chance to cool down. Top each cupcake with the Matcha Buttercream frosting. Refrigerate cupcakes until buttercream is solid. Pour cooled ganache over solid buttercream. 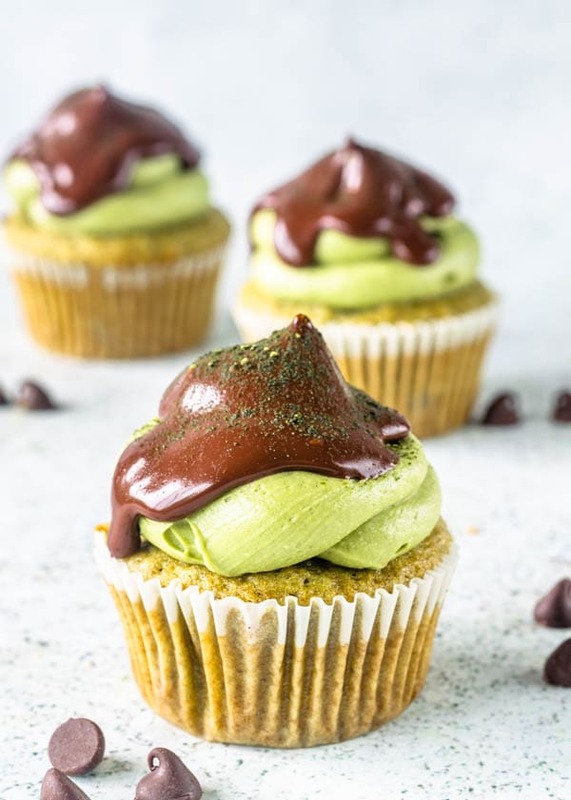 You can sprinkle some matcha powder over cupcakes if you want to. Cupcakes will store nicely and keep moist in a closed container, in the fridge, for up to 3 days. WOW these cupcakes look so luscious and delicious! Perfect for hosting! I love chocolate and matcha together. Thank you so much, dear! I appreciate your comment! Yum! Some of my favorite flavors! I absolutely love how you topped the cupcakes with that dark chocolate ganache. Yum delicious! Matcha sponge sounds so lovely. I really, really, really have to get on the matcha train. I have only tasted it once. These cup cakes look delish. I have been looking to try new cupcakes, these might be the one I need to try now. Gorgeous photos and I love the tips for chocolate chips! I am a recent fan of all things Matcha! Your cupcakes not only sound delicious, they look it too! Very elegant! 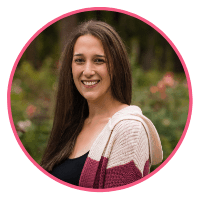 Thank you, Shelby! I am a fan too!! What a fun twist on a chocolate cupcake! Thanks for sharing the recipe. 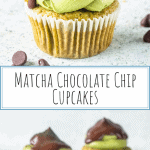 Omg look at these beautiful looking gorgeous matcha choco chip cup cakes! I loved how you dressed them for photography. Also hats off to you for all the details. I love matcha. And want to get that cupcake straight out of here. Looks so delicious. Do you recommend a certain brand of matcha? Yes I do! Right at the end of the post I link the matcha I use for cooking! It’s Jade Leaf brand! Thank you! Mmm, love matcha, and your cupcakes look yummy. I bet these cupcakes taste incredible! They look amazing, too! Wow these are so creative, that frosting and chocolate ganache look to die for! I will pass this recipe along to my granddaughter JULIA who is our CUPCAKE PRINCESS! !